The moment and opportunity have arrived! Sri Lankans are going to the polling booths across the country on this 8th day of January 2015 to elect their next President for a six-year term. The opportunity for voting arrived quite unexpectedly toward the end of last year with much speculation about the possibility of a snap election following UVA Provincial Council elections. No one, I repeat, no one except a few leaders in the opposition coalition would have anticipated what was to come on the political stage. Invitations to various sections of the society and the state sector employees by the President to visit Temple Trees in their thousands were an early indicator of a forthcoming national election as were the plethora of cut outs of the President so visibly erected in cities and towns. Once the election was formally declared the country’s media reported that the President had finished half of his political race. When Maithripala came forward to contest as the common candidate, those at the helm of power stipulated that he and his colleagues will stand no chance of convincing the voters about the merits of changing the government. The ensuing campaign proved otherwise. The will of the people will soon be known. Whatever the outcome, this is ‘a moment’ in Sri Lanka’s political and social history like many other moments that characterised the country’s evolution in good and bad times. Why I say this is because this election campaign allowed simmering tensions underneath the society to surface in a politically and socially articulate manner. The yearning for change aspired by the Buddhist clergy and citizens of varying ranks in the face of many failings of the system and who were in charge of it was translated by opposition politicians, artists, civil society activists and journalists in a manner that was comprehensible to the broader population. Maithripala himself was an articulate speaker who could not only repeat the key points of his message but also add a certain authenticity to the message by virtue of his background, simplistic demeanor, and broad political experience. Whether his message was powerful enough to convince a majority of the voters from the South, North, Centre, the East and West, we will see soon. On the opposite side was a tested and established leader in Mahinda who mainly won the hearts and minds of Sinhalese Buddhist people-and others — when he defeated the Tamil Tigers in 2009. He is equally authentic a political figure from the South whose self confidence grew with each winning election at national and provincial levels. The development projects his government implemented since the war victory was unprecedented in the country’s post independent history. Though certain criticisms started to appear during the political campaign, these development projects are substantial in the eyes of those who have seen and used the facilities. Mahinda and his inner circle, mainly the family, developed certain invincibility as time went by. He became a leader who was bent on developing the country the way he and his brothers wanted. Someone who knew and understood where the country should go in ten, twenty and fifty years. With strong leadership often come certain failings. This could be seen from the emphasis given in his development agenda to the material and tangible aspects rather than the moral, cultural and social justice aspects. Underneath all his government’s development and infrastructure projects and the style of governance his government adopted, the populace became uneasy -except his supporters who believed in his patriotism as the only driver of politico-economic action. He projected himself as a godly figure with extra celestial powers –if not magic- to make things happen. To supplement this image, his supporters from the state machinery and big business developed accompanying symbolisms covered by the pro government media for the consumption of unquestioning public, particularly the rural voter. Such public symbolism is not uncommon in South East Asia. For example, the portraits of the King of Thailand can be seen in many public places. In one such portrait, he can be seen worshipping his elderly mother. In Cambodia, Indonesia and Myanmar also similar practices can be observed. Whether short term, once off, hospitality in Temple Trees, politically motivated gift giving of various sorts, larger than life cut-outs in public places and the 24 hour propaganda through state controlled media will get him through the line in this election, we will see soon. If this is a moment in the country’s history, it is also ‘an opportunity’ for the voting public (and their children) to reflect on what has been happening to their government, society, culture, existence, frames of thought and action enriched by great religions and the democratic heritage inherited from the colonial experiences and state craft evolved in the late colonial period and after. It is a moment that everyone can compare notes, compare what they hear with what they see and feel, tap into their deep consciousness and discover what is joyous about the direction the country is being taken and what is concerning about all this? To judge for themselves with or without witnesses whether we should continue on the same path, i.e. development without substantial democracy and ethnic reconciliation, or choose a different path where the state institutions get reconditioned to drive long distance in a reconciled nation. To decide whether to re-frame society’s moral fabric in a way that it sits neatly with a development model appropriate for the country and vice versa. To decide whether to continue with an imposed peace along with continuing militarisation of the north and the south or change the course to seek a different future which is less costly in human, moral and material terms. Either way, the destiny of the country will be sealed when the election officials seal ballot boxes to be transported to counting centers on the evening of the 8th. If the poll is conducted with no major violence and intimidation, it will be testimony to the high caliber of those who are in charge including the police department that provides security. From first hand experience, I have known that the conduct of elections in Sri Lanka can be done with a high degree of professionalism. However the danger lies in the situations that can arise after the declaration of results. 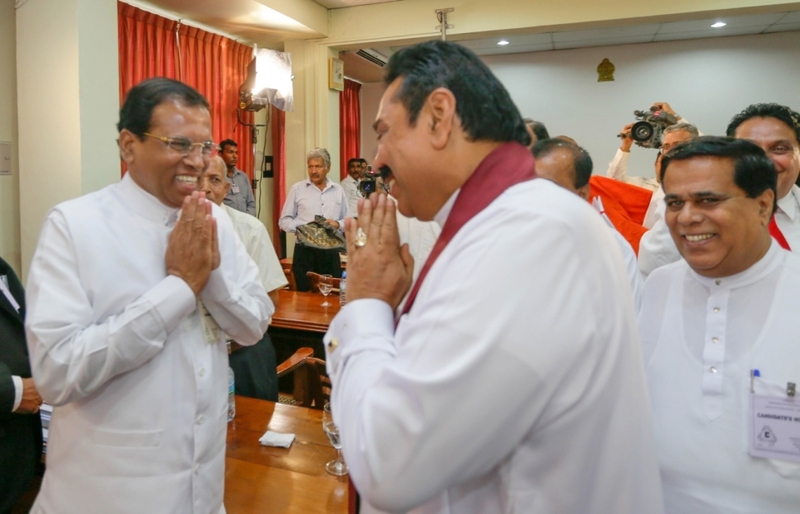 It is important that in a mainly Buddhist country like Sri Lanka, all parties avoid political revenge from the defeated parties and their leaders. So, the moment and opportunity have arrived. Many possibilities are on the horizon for the many millions of my countrymen and women who deserve a better present and a future. May our little Lanka prosper with correct leadership, vision, and virtuous endeavor!